Full Ceramic Bearings have races and balls that are made entirely of ceramic material and are superior to common steel bearings in many ways. Ceramic is the perfect material for any application seeking to achieve higher RPM’s, reduce overall weight or for extremely harsh environments where high temperatures and corrosive substances are present. Because ceramic is a glass like surface it has an extremely low coefficient of friction and is ideal for applications seeking to reduce friction. Ceramic balls require less lubrication and have a greater hardness than steel balls which will contribute to increased bearing life. Thermal properties are better than steel balls resulting in less heat generation at high speeds. Full Ceramic bearings are used in specialty applications like chemical baths, vacuum environments, semiconductor manufacturing, food processing industries, radiotherapy, MRI, patient positioning systems and more. 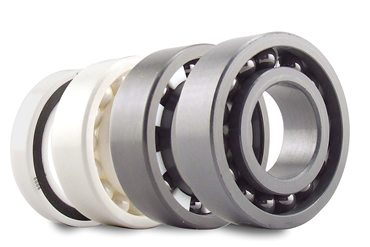 Any extreme environment that requires non-corrosive, non-conductive or non-magnetic bearings is ideal for full ceramic bearings.